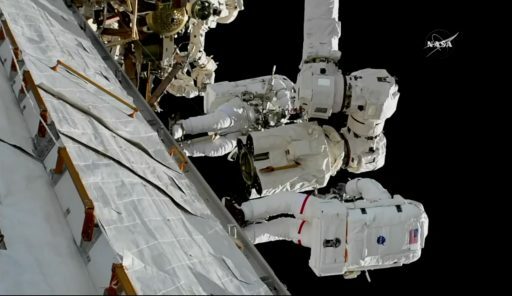 Veteran NASA spacewalker Randy Bresnik and EVA rookie Mark Vande Hei spent nearly seven hours working outside the International Space Station on Thursday, conducting important maintenance on the Station’s robotic arm to return it to a functional configuration after encountering problems back in August. 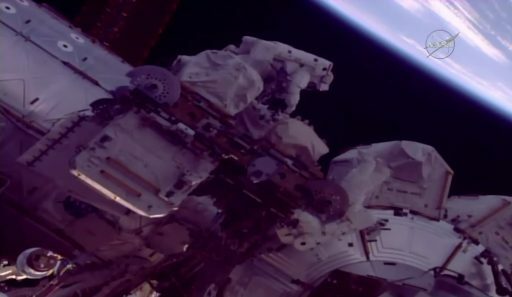 Thursday’s EVA – the 203rd dedicated to ISS Assembly & Maintenance – ran for six hours and 55 minutes and accomplished its major objective of replacing one of two Latching End Effectors on the robotic arm to restore the arm’s capability of walking off between work sites and establishing power & data connectivity with objects it captures. 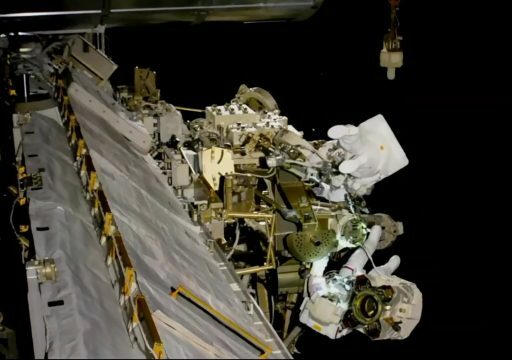 Designated U.S. EVA-44, the excursion was the first in a salvo of three spacewalks planned this month with further work to fully outfit the new end effector, install a number of external cameras and prepare for future external tasks. The two upcoming EVAs are scheduled for October 10 and 18, respectively. Clockwork is a good descriptor for what transpired on Thursday as Bresnik and Vande Hei enjoyed a very smooth EVA with no major hold ups or technical snags typically encountered when completing complex tasks outside the orbiting laboratory. 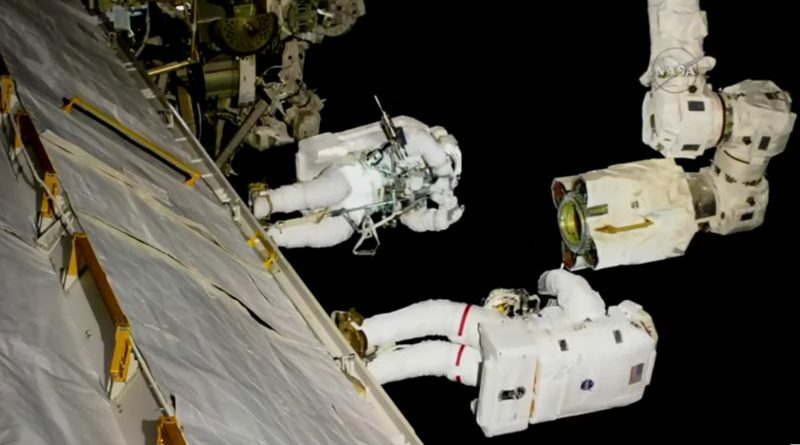 The two successfully switched out a faulty Latching End Effector on the Canadarm2 with a seldom-used unit from a temporary payload holding platform, requiring them to drive a total of two dozen bolts to complete the swap. After giving Canadarm2 a new hand, both astronauts were delighted to hear that the new unit checked out well, marking the arm’s return to full service after limited operations for the last six weeks. The duo also completed two get-ahead tasks to prepare hardware for future robotic and EVA maintenance operations outside ISS. Thursday’s EVA was the eighth outside the International Space Station in 2017, following up on a single Russian spacewalk and six U.S.-based excursions dedicated to the installation of new batteries, external computer upgrades and outfitting of the relocated Pressurized Mating Adapter 3. It was the third career EVA for Expedition 53 commander Randy Bresnik now with a total of 18 hours and 45 minutes, having supported two spacewalks on the STS-129 mission in 2009. 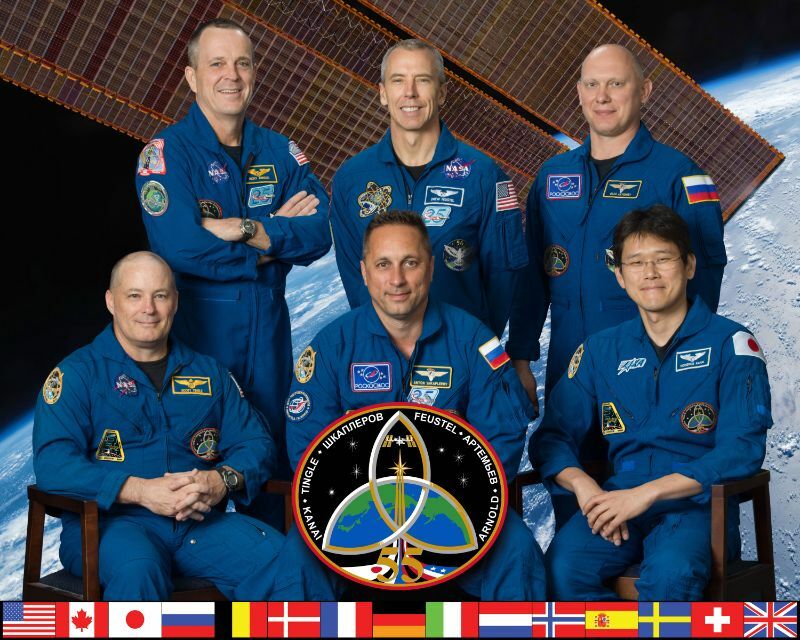 For first-time space flier Mark Vande Hei, this was his first time venturing into the void. 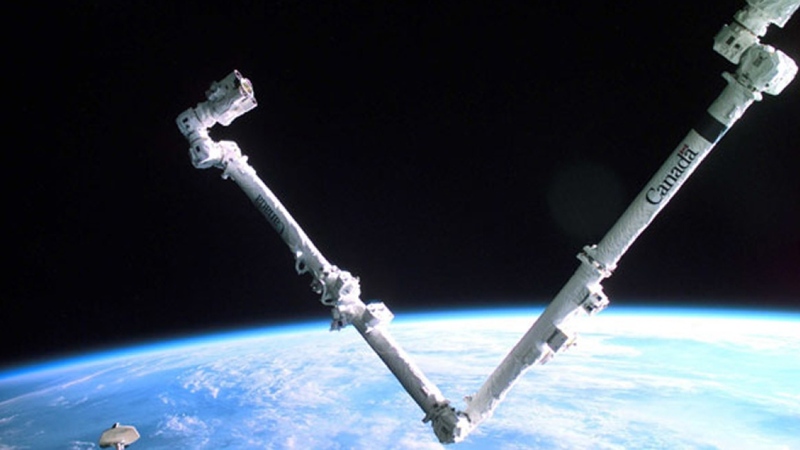 The central objective of EVA-44 revolved around the replacement of Latching End Effector A (LEE-A) on the Space Station Remote Manipulator System, also known as Canadarm2. The Canadian-built robotic arm has become a central element of almost all external operations underway on ISS and keeping it in a functional state is a prime priority for the ISS Program as the Station could not function in its current capacity without the arm. The 17.6-meter long Canadarm2 arrived at the Space Station in April 2000 aboard Space Shuttle Endeavor and has since taken a number of roles within the Station’s operational repertoire. While ISS was being assembled, Canadarm2 was regularly called upon for the installation of ISS modules arriving aboard the Space Shuttle and the assembly of the Station’s 108.5-meter long truss structure would not have been possible without the arm. In September 2009, Canadarm2 captured and berthed its first visiting vehicle when the first HTV cargo craft arrived at ISS and since has completed 25 more such captures involving HTVs, Dragons and Cygnus spacecraft with Canadarm2 also in charge of sending the vehicles on their way after their missions at ISS end. Canadarm2 received a robotic colleague in 2008 when the two-armed Dextre robot arrived at ISS. Since then, the Station’s robotic duo has continuously expanded its capabilities in performing remote-controlled maintenance and freeing up valuable crew time that would otherwise have been spent operating the robots or venturing out on repair EVAs. 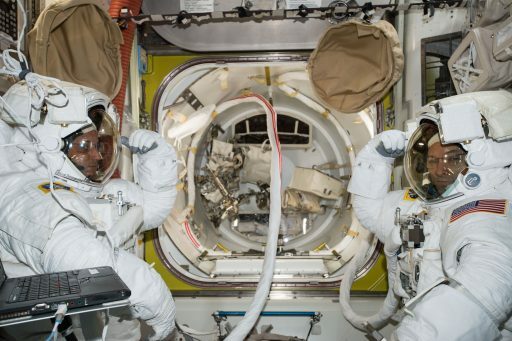 The two showed off their talents earlier this year when completing the major ground work for the replacement of a dozen batteries on the Station’s S4 truss segment, cutting the number of spacewalks required by the crew from six to only two excursions. The 1,800-Kilogram Canadarm2 – a much improved version of the original Canadarm used on Shuttle – features seven motorized joints (an elbow hinge and three rotary joints forming the wrist/shoulder), allowing the arm to move in seven degrees of freedom, much like a human arm but with a much greater range of motion. Either end of the arm has a LEE and can serve as base point for the arm or as free-flying end manipulating items, also allowing the arm to self-relocate between the different Power & Data Grapple Fixtures spread outside the Space Station. Most moving parts of Canadarm2 were designed for a ten-year service life and provisions were put in place to allow all components that can suffer degradation to be changed out in orbit. 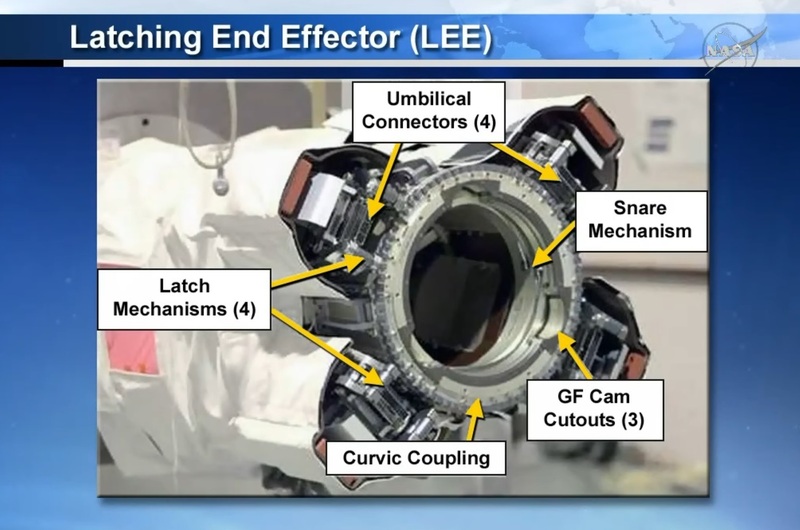 Degradation of the Latching End Effectors became evident in recent years and efforts were made through spacewalks in 2015 to extend their lifetimes by lubricating the moving components within the two LEEs. However, motor currents when the latches were in motion showed that both LEEs would need replacement in the 2017/18 time frame to keep the arm functioning. LEE-B was earmarked for replacement first as it exhibited more severe wear & tear than LEE-A, but plans changed in August when LEE-A unexpectedly suffered a motor stall within its latches – preventing the arm from completing a base change in preparation for the replacement of an external power module. 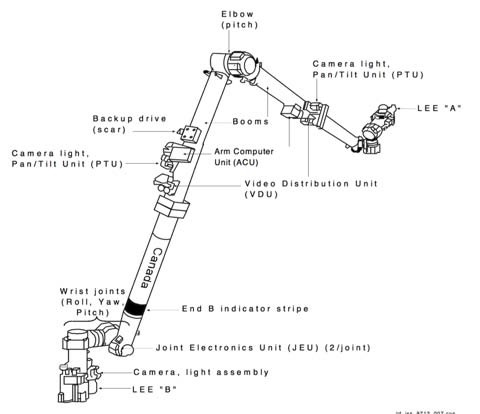 Without the use of its latches, the arm can still grapple items using the snares within the LEE but the LEE can not form an electrical/data bridge which does require the latches – meaning Canadarm2 had lost its ability to complete base changes and could no longer pass power to any items it was holding. 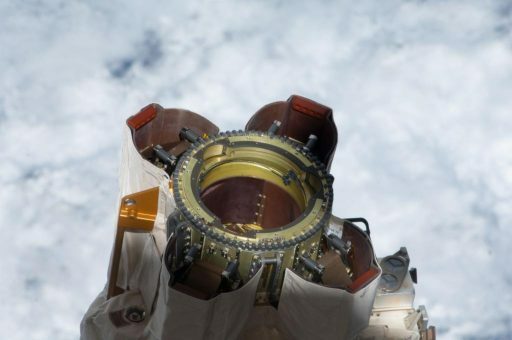 NASA and the Canadian Space Agency that operates the Mobile Servicing System decided to go ahead and change plans, replacing LEE-A instead of LEE-B to get the arm back into a functional configuration. The plan for Thursday’s EVA was to swap the degraded LEE-A, with over 400 cycles under its belt, with the POA LEE that started its career with 15 years serving as temporary payload holding mechanism (Payload/Orbital Replacement Unit Accommodations). Although in space since 2002, the POA LEE was only actuated 14 times and is considered a viable spare with plenty of life left in it. Setting out with the single task of completing the LEE swap, Bresnik and Vande Hei began their EVA at 12:05 UTC after a smooth preparations process that started several hours in advance with the spacewalkers getting into their suits and completing two hours of pre-breathing to purge nitrogen from their blood. 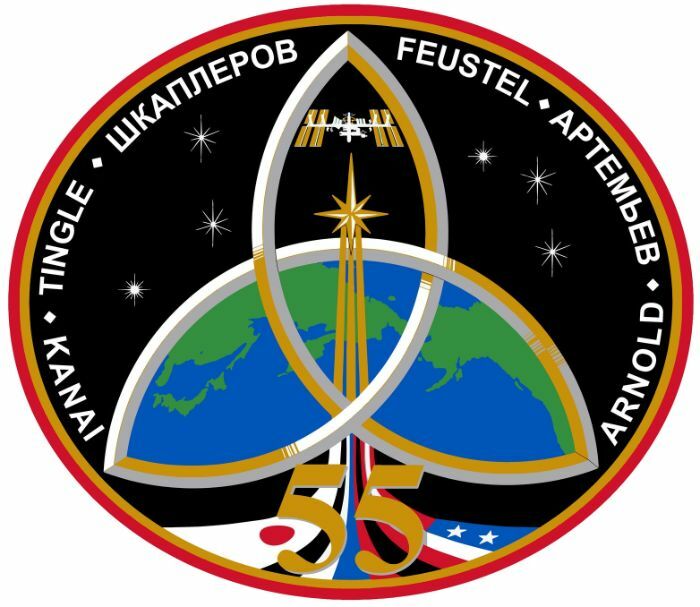 Having four USOS crew members helped in the EVA preparation and no Russian help was required when getting the spacewalkers out the door. After climbing outside, Bresnik and Vande Hei made their way to the P1 truss segment where they set up a pair of foot restraints facing each other so that the arm’s Latching End Effector could be moved in a position between the spacewalkers with ESA Astronaut Paolo Nespoli serving as robotics controller. The spacewalkers removed a pair of Multilayer Insulation blankets to access the LEE-wrist joint interface to release six Expandable Diameter Fasteners. 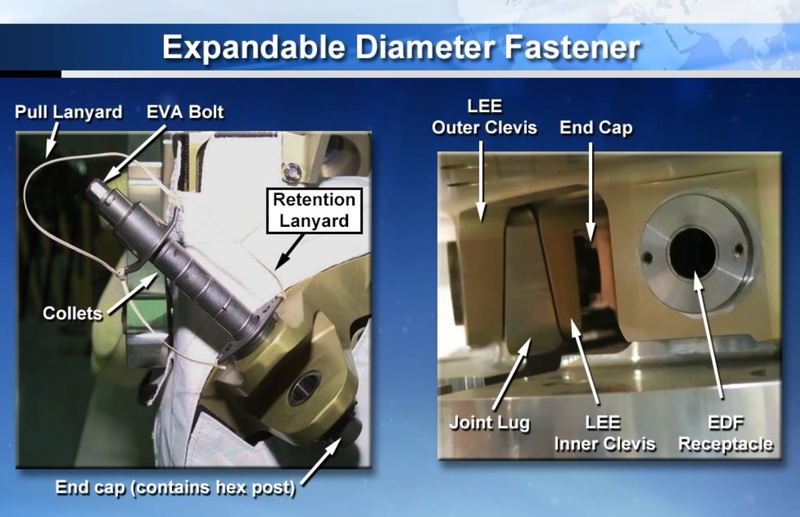 The Expandable Diameter Fasteners (EDFs) were identified as a potential difficulty since they had caused some trouble during earlier EVA operations. These bolts are used in the interfaces of the robotic arm itself and its grapple fixtures due to the high-load environments arising when moving high-mass components. EDFs, as their name suggests, will change in diameter when being driven by pushing out collets in order to form a friction fit with very high stiffness and zero tolerance. 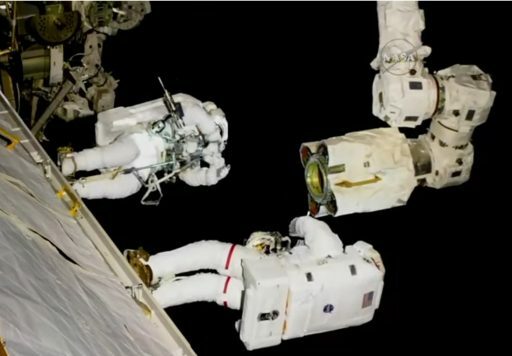 Using their Pistol Grip Tools, the spacewalkers released a pair of EDFs before the LEE was rotated so they could reach the other four with the arm being deactivated before the bolts were released. No issues were encountered during the demating operation and the spacewalkers treaded carefully when moving the one-meter long, 190-Kilogram LEE-A into a temporary stowage location on what is known as a MUT-Ballstack-MUT – essentially a semi-rigid tether with jaws that can hold large hardware pieces. 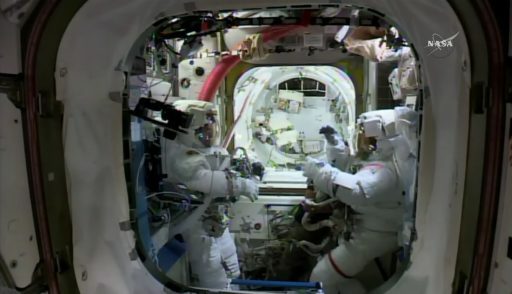 With the former LEE-A (S/N 202) stowed safely, the spacewalkers repeated what they did on the arm at the POA to remove the POA LEE. Again, it was smooth sailing for them as all bolts released without issue and the team could move the LEE over to Canadarm2 to provide it with a new & healthy hand. Installing the former POA LEE (S/N 203) on Canadarm2 to become LEE-A took some more time than removing the old one as each bolt needed careful torquing to ensure all EDFs were expanded with zero tolerance in any of the interfaces. This was accomplished by multiple ‘re-triggers’ with the crew’s Pistol Grip Tools until be bolts would no longer move at the pre-set torque value. After installation was reported complete, Canadarm2 was re-powered and put through an initial checkout with Mission Control noting full functionality to the spacewalking crew members. More in-depth tests of the LEE actuators, force moment sensors and camera will be completed via an initial base change with the new LEE on Friday to set up for the next EVA. The last task out at P1 for the crew was the installation of the former LEE-A on the POA, again taking some time with multiple triggers on each of the EDF bolts to fully secure the mechanical interface. Although in a degraded state, the POA can still be used to temp-stow hardware items; however, it does not have the ability to pass power to whatever it is holding. Per the forward plan, LEE-B will be replaced around January and the POA LEE will also need replacement before it can again hold a powered payload such as the HTV Exposed Pallet. ISS currently has four LEEs – two on Canadarm2, the degraded POA LEE and one pristine spare on ELC-1, delivered in 2009. A flight-ready spare is available on the ground to fly to ISS on a cargo vehicle. Having raced through the LEE replacement task, Bresnik and Vande Hei were half an hour ahead of schedule, allowing them to each tackle a get-ahead task. Both translated over to External Stowage Platform 2, located conveniently next to the airlock, where Bresnik removed a Multilayer Insulation Cover from a spare Direct Current Switching Unit (DCSU) and Vande Hei released launch locks from a Flex Hose Rotary Coupler (FHRC) – steps taken to ready these spares for potential future use. The removal of MLI from the DCSU will allow it to be moved robotically in the future and preparing the FHRC will ease the timeline of a future replacement should issues arise within this particular thermal control component. 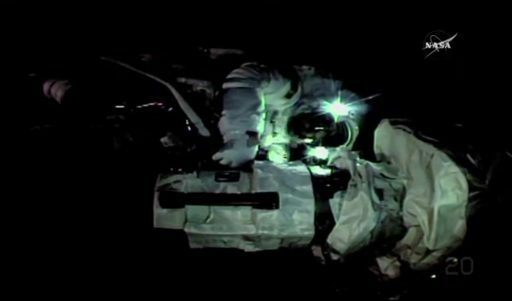 With all primary tasks complete and two get-aheads checked off, the spacewalkers were able to call it a day and move back into the Quest airlock with the EVA coming to a close at 19 UTC sharp after an elapsed time of 6 hours and 55 minutes. Bresnik and Vande Hei are hoping to have an equally successful EVA-45 next Tuesday which – unlike Thursday’s excursion – will see them work a number of tasks including the rotation of a spare Pump Flow Control Subassembly on the Destiny lab to allow it to be vented on a future EVA, the replacement of a camera group on Camera Port 9 on the lower port truss segment, lubrication of the central ball screw of the new LEE-A, replacement of a camera lens on the Mobile Transporter, and the removal of two hand rails on the Tranquility module.